One of the best people I know just gave me a fantastic present, straight from Brazil. 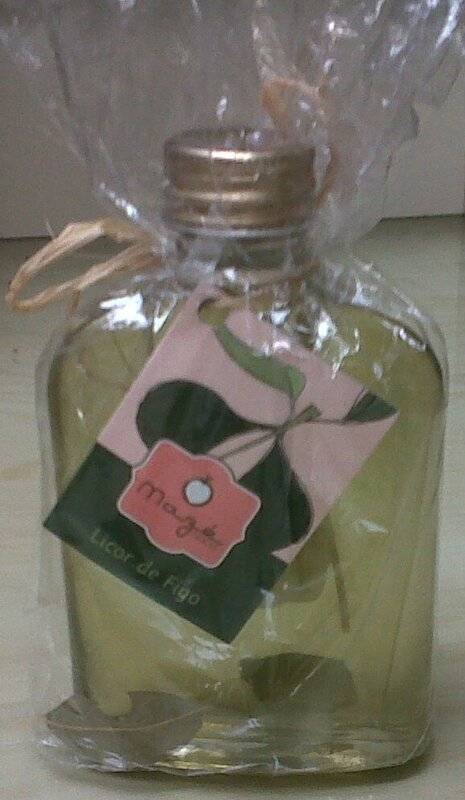 Licor de Figo is alcohol infused with fig leaves, sort of the Brazilian answer to Limoncello (one of my favorite digestivos). The best part about this is that figs are in season right now, so I’m sure I can incorporate my Licor de Figo into something delicious. I’m thinking either a variant on Grilled Fig and Stilton Salad with Port Wine Vinaigrette (using LdF instead of/along with port wine) or a Fig and Almond Tart, so I can try whipped cream infused with LdF. But, I still need to resolve my immersion blender situation if I’m going that route. I’ve been getting better acquainted with Brazilian food and drink in general over the past few weeks, and one of my favorites, Muqueca, has become even better when seen through a new set of eyes. Muqueca just moved to a new, larger location (right across the street from its previous spot), so it has less of an “I’m in my grandmother’s kitchen” feel, but it’s still homey. Try something from the juice bar- my favorite is the Blueberry Mix (blueberry, papaya and orange juice), and the fried yucca, then get whatever your server recommends. For us, the recommendation was the Mariscada: shrimp, crabmeat, mussels and squid with cilantro, tomato, onion and coconut milk, served with Farofa. Farofa, a popular side dish in Brazil, is a toasted yucca flour mixture. 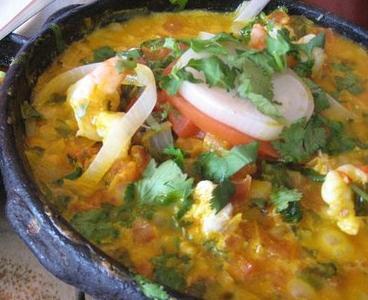 Muqueca’s Farofa has a grainy texture but a nice mellow flavor- kind of an acquired taste. I don’t know enough about Brazilian food (yet) to say whether or not Muqueca is an authentic example of the cuisine, but I do know that the place is always friendly, unique (to me), and flavorful.